The coinage of the Seleucid Empire is based on the coins of Alexander the Great, which in turn were based on Athenian coinage of the Attic weight. Many mints and different issues are defined, with mainly base and silver coinage being in abundance. A large concentration of mints existed in the Seleucid Syria, as the Mediterranean parts of the empire were more reliant on coinage in economic function. The symbol of Seleucid power was the anchor, which was placed on the obverse of coins depicting Alexander posthumously. Some Seleucid bronze coinage feature decorative serrated edges similarly with certain Roman denarii and rare Macedonian coins. The first Seleucid royal mint was at Seleucia on the Tigris. 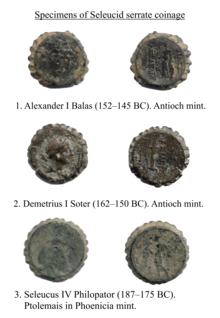 Antioch, as a new capital, did have the most important mint after Seleucus I moved mint workers there from Seleucia. Bronze coinage was issued in five denominations; the weight and size varies greatly and most likely no effort was made to conform to a set standard, they may be denominated in chalkoi. 1 Obol: Anchor and Bow and Quiver. Coins with the head of Zeus on the reverse and Athena in elephant car. These coins are of a lighter Phoenician standard. Successor states of the Macedonian Empire continued to mint coins with image of Alexander the Great. Such coins were widespread within the Seleucid Empire, as all mints except the one in Bactra struck them. Antiochus I, son of Seleucus I, was the first Seleucid ruler to strike coins with his own image on them. Typically, coins which were not based on Attic weight, did not circulate within the empire. Attalid, Ptolemaic and Rhodian coins were using a different standard. Regulations may have existed to enforce usage of the Attic standard. However, the regulations were probably made for practical reasons rather than being politically motivated. Coele-Syria and Phoenicia were exceptions to the rule of using the Attic standard. They were conquered by Antiochus III the Great in 200 BC. Seleucids struck some coins in the Ptolemaic standard to be used in the region, and both standards coexisted there. Seleucid regulations on coinage different from Achaemenid Persia on several aspects. Achaemenid rulers did not try to unify standards for the coinage, and they allowed local satraps to strike coins in their own name. While the Seleucids preserved the system of satraps, they banned local rulers from striking coins in their own name. Some cities had their own mints for bronze coinage, while gold coins and large silver denominations were made only at the royal mints. However, the empire controlled on some extent even the striking of local bronze coinage. After Antiochus III was defeated in a war against Rome and a large war indemnity had to be paid, silver coinage became scarcer and lighter. There were few new silver coins struck for two decades after the defeat. 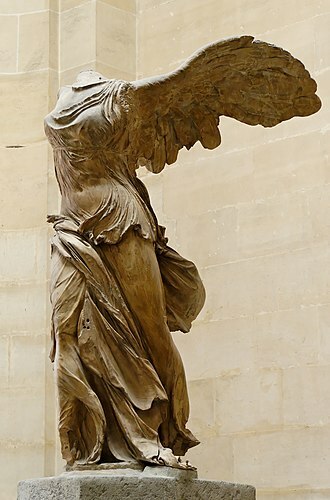 Bronze mostly replaced silver in mints between 173 BC and 171 BC. When the Seleucid Empire began to decline, and its rule on parts of the empire weakened since the last decades of the second century BC, local cities began producing their own silver coinages to show their autonomy from the central bureaucracy. Despite seemingly enforcing some regulations, Seleucid policy was still somewhat free compared to the Ptolemaic Kingdom which imposed an exclusive royal currency. In coin making process there were similarities with the Ptolemaic coinage. For instance, the Seleucid coins often have a central depression from the coin making process. Seleucid core territory around Syria had a large concentration of mints. Eastern provinces had a single mint each. Mediterranean regions of the Seleucid kingdom were more monetized, and were economically more reliant on coinage. Use of coinage in Mesopotamia, including areas such as Babylonia and Susiana, was most likely mainly an urban phenomenon, while in rural areas Greek coinage was not necessary for daily life. 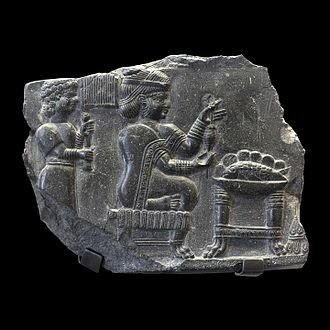 In Mesopotamia taxation and official payments were most likely the parts of economy where coinage saw usage. Despite Mesopotamia sawing increasing use of coinage during the Hellenistic period, the impact may have been a modest one. Traditional methods of payment did not disappear. Seleucia on the Tigris held the first Seleucid mint as a capital. Later, when Seleucus I Nicator prioritized construction of an important port city of Antioch over Seleucia, workers from the Seleucia mint were moved to new capital at Antioch. The mint at Antioch produced gold coins, as well as royal bronze coins minted in name of the king. The old mint at Seleucia functioned as a municipal mint at this point, and they did mint the coins in their own name. Furthermore, the mint at Antioch produced more bronze coins than Seleucia. Seleucid dynasty seems to have attempted to create a uniform coinage throughout the empire, as coins with similar symbols and images have been discovered from coinage minted all around the empire. These common symbols include an anchor and a charging bull. Early coinage of the Seleucid Empire was struck in name of Alexander the Great, or the coins at least included his image. Bactra mint was an exception to this almost universal rule as it did not strike coins with the image of Alexander the Great. Mint in Ptolemais in Phoenicia was among the most active ones. While other mints generally used Attic weight, the one in Ptolemais struck coins in a different weight, even after it was conquered by Antiochus III the Great. It is likely that the city struck silver coinage without an interruption after it changed hands, as it was a very important city in Phoenicia. Anchor was the symbol of Seleucid dynasty starting from the reign of Seleucus I Nicator in 305 BC, and it was used by his successors. The anchor first appeared in reverses of coins with Alexander the Great's image in them. Such coins with Alexander in them were very common in the Diadochi states. Origins of the anchor as a symbol is obscure, but there are several theories about the origin. 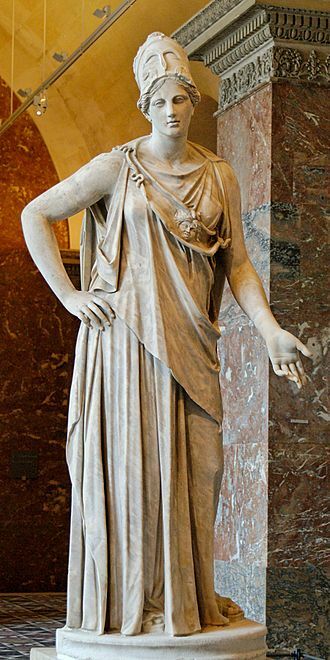 For instance, it may commemorate Seleucus' career under Ptolemaic rule between 315 BC and 312 BC. 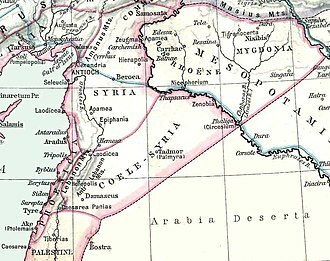 Another theory is that the anchor was a form of propaganda aimed at merchants to lure them back into Northern Syrian cities and their new harbors built by Seleucus. After Seleucus I's death, his successors began to strike coins with their own image. Coins of the Seleucid Empire had imagery including a reigning king with a lion head dress, or Zeus on a throne with a sceptre and eagle in each hand. Certain coins portrayed a god or goddess, or in some cases they had a medusa, a charging bull or an anchor. Coinage struck by Antiochus IV Epiphanes can be considered to be iconographically innovative when compared to other Seleucid rulers. He is associated with various celestial attributes and symbols such as stars and rays about his head. Both Antiochus IV and Seleucus IV Philopator struck coins with the solar deity Helios. Another deity closely associated with reign of these two rulers and brothers is Apollo. Certain Seleucid bronze coinage have serrated edges, otherwise rare in ancient coins. They are sometimes called bottle cap coins. [better source needed] Seleucid mints struck this type of bronze coinage within an approximate period of 187 BC–141 BC. This period was between reigns of Seleucus IV and Antiochus VI. As a comparison, there are known instances of coins with serrated edges from the Kingdom of Macedon during the reign of Philip V. Like in the Seleucid mints, the Macedonians did also somewhat quickly discard the process. One theory is that the serrated edge made it easier to prove that the coin was solid metal. However, only the Seleucid bronze coinage, rather than coins of gold and silver, feature this sort of an edge. [better source needed] Certain Roman serrated denarii were especially designed to be harder to counterfeit or debase. However, the Roman efforts probably failed since there are silver plated copper denarii in existence. Seleucids are believed to not have serrated their coins as an anti-counterfeiting measure. Syrian mints serrated their coins simply as a decorative method, and it is also possible that the Romans also sought only the aesthetic value. ^ "A history of the Seleukid Empire and its kings". Archived from the original on June 17, 2006. Retrieved June 8, 2006. ^ "Seleukos I. 312-280 B.C. AR tetradrachm. 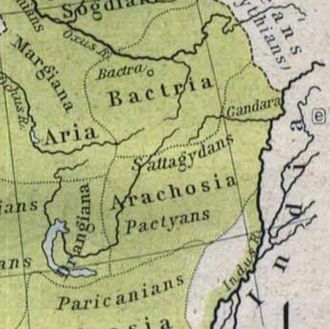 Seleucia on the Tigris, 296/5 B.C. * Sear GCV sg6856 * WildWinds.com". www.wildwinds.com. ^ a b c d e f g h i j k Christopher Howgego (11 September 2002). Ancient History from Coins. Routledge. pp. 38–39. ISBN 978-1-134-87783-6. ^ a b c Newell, Edward T. "The first Seleucid coinage of Tyre". Digital Library Numis (DLN). pp. 1–2. Retrieved 17 December 2017. ^ Michael Hewson Crawford (1985). Coinage and Money Under the Roman Republic: Italy and the Mediterranean Economy. University of California Press. p. 155. ISBN 978-0-520-05506-3. ^ a b c d Otto Mørkholm (31 May 1991). Early Hellenistic Coinage from the Accession of Alexander to the Peace of Apamaea (336-188 BC). Cambridge University Press. p. 13. ISBN 978-0-521-39504-5. ^ a b c d George MacDonald (22 March 2012). The Evolution of Coinage. Cambridge University Press. pp. 68–69. ISBN 978-1-107-60599-2. ^ a b c d e f Waldemar Heckel; Richard Sullivan (30 October 2010). Ancient Coins of the Graeco-Roman World: The Nickle Numismatic Papers. Wilfrid Laurier Univ. Press. p. 94. ISBN 978-1-55458-699-8. ^ a b c d e f g h i j k R.J. Van der Spek; Jan Luiten van Zanden; Bas van Leeuwen (4 September 2014). A History of Market Performance: From Ancient Babylonia to the Modern World. Taylor & Francis. pp. 501–. ISBN 978-1-317-91849-3. ^ a b Getzel M. Cohen (1995). The Hellenistic Settlements in Europe, the Islands, and Asia Minor. University of California Press. p. 129. ISBN 978-0-520-08329-5. ^ a b c d Daniel Ogden (30 April 2017). 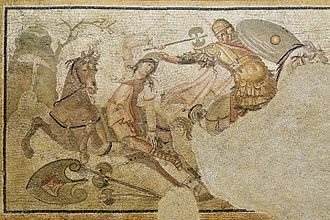 The Legend of Seleucus: Kingship, Narrative and Mythmaking in the Ancient World. Cambridge University Press. p. 120. ISBN 978-1-316-73844-3. ^ Michael Pfrommer (20 May 1993). Metalwork from the Hellenized East: Catalogue of the Collections. Getty Publications. p. 25. ISBN 978-0-89236-218-9. ^ a b c Antela-Bernardez, Borja. "The anchor and the crown: Seleucos' use of the" anchor" coin type in 305 BC". 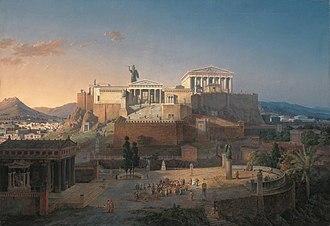 Athenaeum: Studi di letteratura e Storia. Retrieved 17 December 2017. ^ "Ancient Coinage of Seleucia, Antiochos I". www.wildwinds.com. Retrieved 24 December 2017. ^ Lorber, Catharine; Iossif, Panagiotis (17 December 2017). 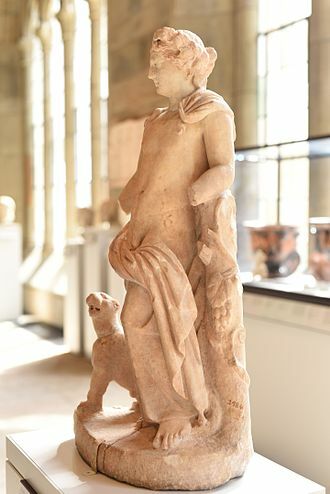 "The cult of Helios in the Seleucid East". Topoi. 16 (1): 19–42. doi:10.3406/topoi.2009.2289. Retrieved 17 December 2017. ^ Jceaus (8 May 2007). "Ancient Coin Cleaning And Restoration: What In The World Are Seleucids Or "Bottle Caps?"". Retrieved 14 December 2017. ^ Wolter, Tim (7 February 2014). "Detritus of Empire: A Mystery Coin - Who Are You?". Retrieved 14 December 2017. ^ Seth William Stevenson; Frederic William Madden (1889). A Dictionary of Roman Coins, Republican and Imperial. G. Bell and Sons. William E. Metcalf (23 February 2012). The Oxford Handbook of Greek and Roman Coinage. OUP USA. ISBN 978-0-19-530574-6. Houghton, Arthur; Lorber, Catharine C.; Hoover, Oliver; Kitt, Brian (2002). Seleucid coins : a comprehensive catalogue I: Seleucus I through Antiochus III. New York: American Numismatic Society. ISBN 9780970926838. Houghton, Arthur; Lorber, Catharine C.; Hoover, Oliver (2008). Seleucid coins : a comprehensive catalogue II: Seleucus IV through Antiochus XIII. New York: American Numismatic Society. ISBN 9780970926845. Wikimedia Commons has media related to Seleucid coins. Harran was a major ancient city in Upper Mesopotamia whose site is near the modern village of Altınbaşak, Turkey,44 kilometers southeast of Şanlıurfa. The location is in a district of Şanlıurfa Province that is named Harran. 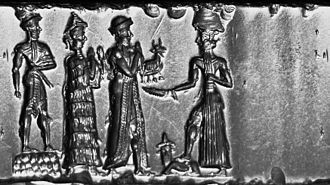 It was known as Ḫarrānu in the Assyrian period, Ḫaran in the Hebrew Bible, Carrhae under the Roman and Byzantine empires, Hellenopolis in the Early Christian period, the earliest records of Harran come from Ebla tablets. From these, it is known that a king or mayor of Harran had married an Eblaite princess, who became queen of Harran. It appears that Harran remained a part of the regional Eblaite kingdom for some time thereafter, royal letters from the city of Mari on the middle of the Euphrates, have confirmed that the area around the Balikh river remained occupied in c. the 19th century BCE. A confederation of tribes was especially active around the region near Harran at that time. By the 19th century BCE, Harran was established as a merchant outpost due to its ideal location, the community, well established before then, was situated along a trade route between the Mediterranean and the plains of the middle Tigris. It lay directly on the road from Antioch eastward to Nisibis, the Tigris could be followed down to the delta to Babylon. Not only did Harran have easy access to both the Assyrian and Babylonian roads, but to north road to the Euphrates that provided access to Malatiyah. According to Roman authors such as Pliny the Elder, even through the classical period, in its prime Harran was a major Assyrian city which controlled the point where the road from Damascus joins the highway between Nineveh and Carchemish. This location gave Harran strategic value from an early date, because Harran had an abundance of goods that passed through its region, it became a target for raids. In the 18th century, Assyrian king Shamshi-Adad I launched an expedition to secure the Harranian trade route, after the Suppiluliuma I–Shattiwaza treaty between the Hittite Empire and Mitanni, Harran was burned by a Hittite army under Piyashshili in the course of the conquest of Mitanni. In the 13th century BCE, Assyrian king Adad-Nirari I reported that he conquered the fortress of Kharani and it is frequently mentioned in Assyrian inscriptions as early as the time of Tiglath-Pileser I, about 1100 BCE, under the name Harranu. Amrit or Amrith, known as Marathos or Marathus, was an ancient Phoenician city located near Tartus in Syria. Founded in the third millennium BC and abandoned during the second century BC, the city lies on the Mediterranean coast around 6 kilometres south of modern-day Tartus. Two rivers cross the city, Nahr Amrit, near the temple, and Nahr al-Kuble near the secondary temple. 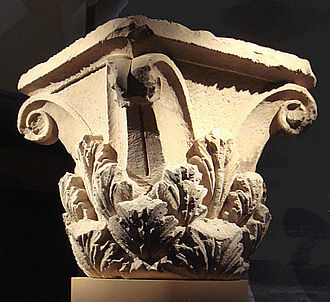 The city was founded by the Arvadites, and served as their continental base. It grew to be one of the wealthiest towns in the dominion of Arwad, the city surrendered, along with Arwad, to Alexander the Great in 333 BC. During Seleucid times the town, known as Marathus, was probably larger, in 219 BC Amrit gained independence from Arwad, and was sacked by forces from the latter city in 148 BC. Excavations of the site began in 1860 by Ernest Renan. Excavations were again carried out in 1954 by French archaeologist Maurice Dunand, ceramic ware finds at Amrit indicated the site had been inhabited as early as the third millennium BC. Middle and Late Bronze Age silo tombs were excavated, with contents ranging from weapons to original human remains. Excavations at the south of the town yielded several tomb structures. The funeral art found in tombs with pyramidal-or cube-shaped towers, is considered some of the most notable grave-monuments of the Phoenician world. Excavations uncovered the ancient harbor, and a U-shaped stadium that dates back to the 4th and 3rd centuries BC. 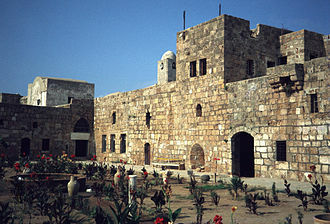 One of the most important excavations at Amrit was the Phoenician temple, commonly referred to the maabed, dedicated to the god Melqart of Tyre and Eshmun. The colonnaded temple, excavated between 1955 and 1957, consists of a large cut out of rock measuring 47 ×49 metres and over 3 metres deep. In the center of the court a well-preserved cube-shaped cella stands, the open-air courtyard was filled with the waters of a local, traditionally sacred spring, a unique feature of this site. The temple—which was dated to the late 4th century BC, a following the Persian expansion into Syria—shows major Achaemenid influence in its layout. Alexander Balas and Cleopatra Thea.